Elegant in theory, Beijing’s grand strategy is triggering an Asian security dilemma. The 2011 Chinese White Paper “China’s Peaceful Development,” lists the six core Chinese interests as 1) state sovereignty; 2) national security; 3) territorial integrity; 4) national reunification; 5) China’s political system established by the Constitution and overall social stability; 6) basic safeguards for ensuring sustainable economic and social development. 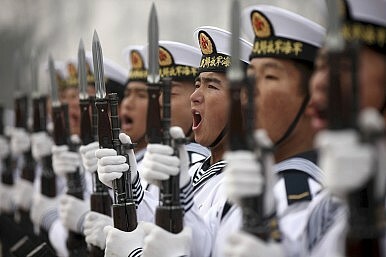 The concept of core interests is how the CCP signals the issues it is willing to go to war over. In the past, Chinese spokespeople have referred to both contested South and East China Sea territorial claims as core interests, but officially at least, the CCP has maintained ambiguity about their status. Still, the CCP has been clear that it considers its territorial claims to be sovereign Chinese territory, so maintaining these claims would fall under the core interests listed in the 2011 White Paper. In addition, in contrast to the ambiguity of its maritime claims, the CCP has been clear that Taiwan is a core interest, and it is unwilling to rule out the use of force to reunify China. China’s pursuit of its core interests has the potential to trigger great power rivalry or conflict with the United States and other regional powers. This is why in 2010 then Chinese President Hu Jintao told U.S. President Barack Obama that “China and the United States should respect each other’s core interests and major concerns. This is key to the healthy and stable development of bilateral ties.” Current Chinese President Xi Jinping has articulated a similar concept in his vision for a “new type of great-power relationship” between China and the United States. This slogan has now become commonplace in Chinese official speeches and media when describing the U.S.-China relationship. Together, the concepts of “core interests” and a “new type of great power relationship,” demonstrate the CCP’s vision of China’s future. In this vision, China and the United States will enjoy an equal relationship with clearly defined core interests that the other will not interfere with. This will result in China assuming a preeminent place in Asia, with a large sphere of influence encompassing much of the South and East China Seas, and a reunification with Taiwan. The CCP also relies on increasing military deterrence to prevent other states from interfering in Chinese core interests. Xi has made it clear that some issues are non-negotiable, saying “While we pursue peaceful development, we will never relinquish our legitimate rights and interests, or allow China’s core interests to be undermined.” In line with this strategy China’s defense spending has been steadily increasing, its 2015 budget of $145 billion is a 10 percent increase of its 2014 budget, which was a 12.2 percent increase over its 2013 budget, and is a larger defense budget than Japan, South Korea, Taiwan, and Vietnam’s combined. Much of Chinese strategic thinking is based on the writings of Sun Tzu, who wrote Art of War during the Spring and Autumn period of Chinese history. Sun Tzu believed that “all warfare is based on deception,” and that “supreme excellence consists in breaking the enemy’s resistance without fighting.” This latter concept is not a pacifistic notion, but demonstrates the primacy of psychological factors over purely military ones. The PLA put this belief into practice during the 1996 Taiwan Strait Crisis. The 1996 Taiwan Straits crisis occurred due to the CCP’s perception that the United States was changing its relationship with Taiwan, and that Taiwan was moving towards independence from China, which threatened China’s core interest of national reunification. To coerce the United States and Taiwan into changing their behavior, China conducted naval exercises and fired off shore missiles in the waters near Taiwan. When these displays of force were insufficient to convince the U.S. and Taiwan to change their behavior, China escalated by conducting military exercises two weeks before Taiwan’s upcoming November 15 election, including a simulated amphibious landing on Taiwan-held islands. Chinese escalation of force did change U.S. behavior towards Taiwan, gaining a U.S. recommitment to the one China principle and deterring Taiwan from declaring independence. However, this success came at a price: The United States sent two carrier battle groups through the Taiwan Straits. At the time, China was unable to prevent U.S. naval access to the Taiwan Straits. After this incident, the PRC decided on an anti-access strategy that would depend on asymmetric capabilities and tactics designed to prevent a repeat of the humiliating incident. A key component of this strategy is the idea of active defense, articulated in this passage from the PLA’s 2001 Science of Military Strategy: “We should do all we can to dominate the enemy by striking first. Once the enemy invades our territory and offends our national interests, it means that the enemy has already fired the first shot strategically and crossed the border of our strategic defense.” This passage’s vagueness presents potential adversaries with a difficult situation when trying to gauge what constitutes an offense to Chinese national interest or Chinese territory, making it difficult to anticipate PLA action if they enter what China considers its airspace or maritime territory. The PLA is enhancing the deterrent effect of its active defense concept through anti-access strategy and capabilities. While the Chinese military is much less developed than its U.S. equivalent, this advantage fades the closer the United States is to Chinese territory. Because of this, China does not have to match U.S. military might; rather, it has to develop the capability to create a contested zone where China has a good chance of damaging U.S. forces. In this contested zone, the PLA is seeking the capability to win air and sea control from enemy forces by concentrating its forces at strategic points, denying access to outside powers. To accomplish this, the PLA has developed a range of capabilities and tactical strategies including using water mines, submarines and air capabilities to create a blockade to prevent an enemy force from leaving its naval bases or accessing key sea-lanes. In the CCP’s perfect world, its growing military and political capabilities will allow it to create a new great power relationship with the United States based on the understanding of non-interference in each other’s core interests. Through the CCP’s “humane authority,” it will establish an alternative international system based on a new set of norms that will win it friends and allies. China’s ambiguous policy of active defense along with its anti-access capabilities will deter any outside threat to its core interests. This will ensure the proper environment for the CCP to continue its peaceful development, and will strengthen CCP legitimacy, meeting the overarching objective of regime survival. In a sterile environment, this strategy is elegant and comprehensive, but in reality the other side always gets a vote and often does not act as planners predict or prefer. American strategic thinker Edward Luttwak describes this problem as the paradoxical logic of strategy. According to the logic of strategy, as China grows economically, it will spend more on military capabilities, as it develops more military capabilities other states will fear China’s rise and will counter-balance against China and seek to constrain China through economic and strategic means. For China, pursuing its current grand strategy has not resulted in increased moral legitimacy and attractive power; instead it is triggering an Asian security dilemma, encouraging increased military spending by other powers in the region like Japan and South Korea while driving countries like Vietnam and Singapore to closer alignment with the United States. In addition, even if China can deter the United States from using forcing through its anti-access strategy, the U.S. and others can respond through geo-economic means, such as targeted financial sanctions, trade barriers for sensitive technology, or even restrictions on trading raw materials. Any of these geo-economic strategies has the potential to undercut China’s economic growth and threaten the CCP’s legitimacy, undermining the original goal of long-term regime survival.